Anyone who does mapping is aware that there are many different types of map projections, which impact on the type of coordinates produced for any given point in space. The eternal problem of representing a point on a sphere in a two-dimensional depiction, whilst retaining some degree of accuracy (and the ability to relocate said point in space again!) has caused geographers, mathematicians, cartographers, navigators and the rest of us headaches for centuries. 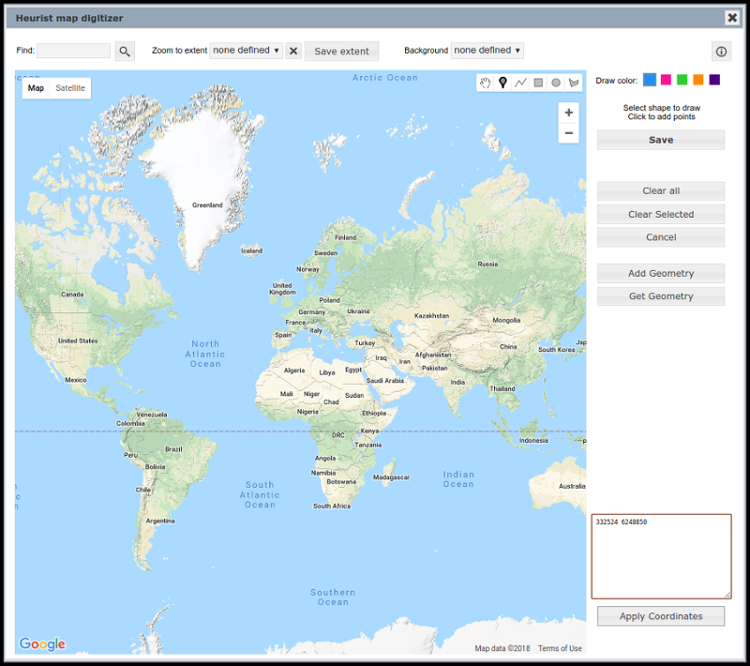 Heurist records coordinates in digital degrees (longitude and latitude), since they provide a unequivocal worldwide coordinate system and are the base for most web mapping systems, Google Earth and GPS navigation. 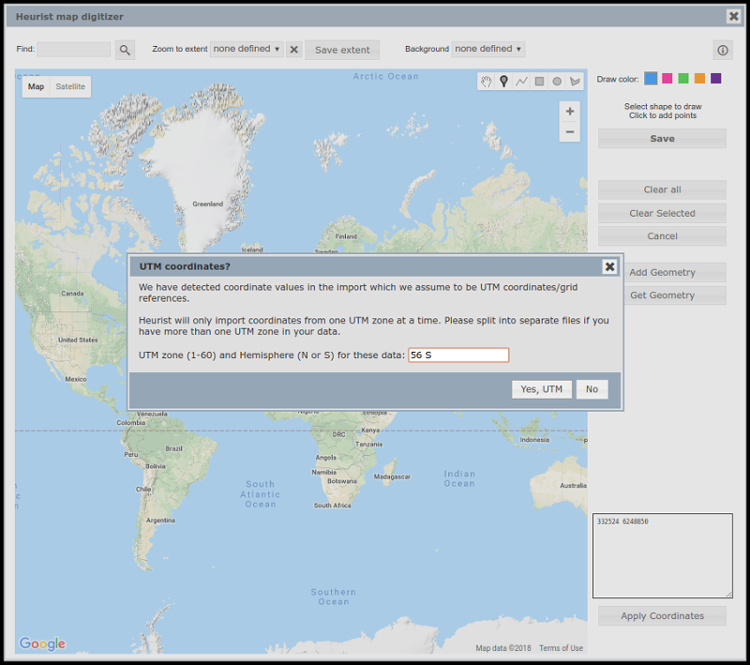 Following a request from a user, our developers have now implemented the ability to read and convert UTM (Universal Transverse Mercator) coordinates – the grid coordinates on topographic maps – in both the location digitiser (within the record editor), as well as the CSV import (for bulk uploads). 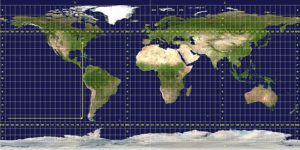 Lat/long and UTM are the two coordinate systems in which data are likely to be collected; projections other than UTM are generally only used for map display. UTM divides the globe into 60 zones (each 6 degrees of longitude wide) divided at the equator between the two hemispheres. Latitude bands, which segment the UTM zones and assign a letter code (A to M in the Southern Hemisphere and N to Z in the Northern Hemisphere) are sometimes also used with UTM coordinates, but these bands actually belong to a military grid reference system and are not required for positioning within the UTM coordinate system. All that is required for a UTM location is the Easting and Northing (measured in metres from the origin of each zone) and the zone number and the hemisphere in which the location is situated. Thus a sample set of UTM coordinates looks like this: 332494 6248931 56 S; which shows the number of metres East and North of the origin of zone 56 in the southern hemisphere. 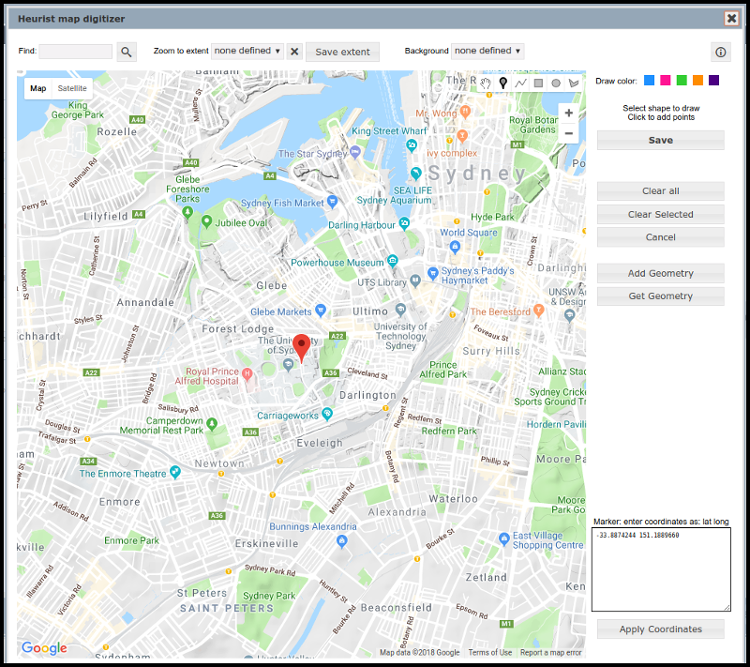 Using the field “Location (mappable)” (or any other field defined as a geographic object type) in Heurist allows locations to be marked according to their geospatial position, either through the mapping digitiser interface (shown above), or by a CSV import. This field is included by default in record types such as “Place”, but can also be included in other record types as needed. To enter coordinates manually, type the coordinates into the box in the lower left of the digitiser screen, shown here highlighted in orange. Type over the text which provides prompts for those wishing to digitise directly onto the map. You can enter either latitude and longitude coordinates in digital degrees; or an Easting and a Northing as UTM coordinates. Once you have entered coordinates, click on the Apply Coordinates button. Heurist will automatically detect the UTM coordinates and ask for the zone and hemisphere, as shown in the image at the top of this page. The location will then be marked in the correct place within Heurist’s map digitiser interface, as shown below, and the coordinates converted to digital degrees. A very similar process will occur with a CSV import using UTM coordinates. 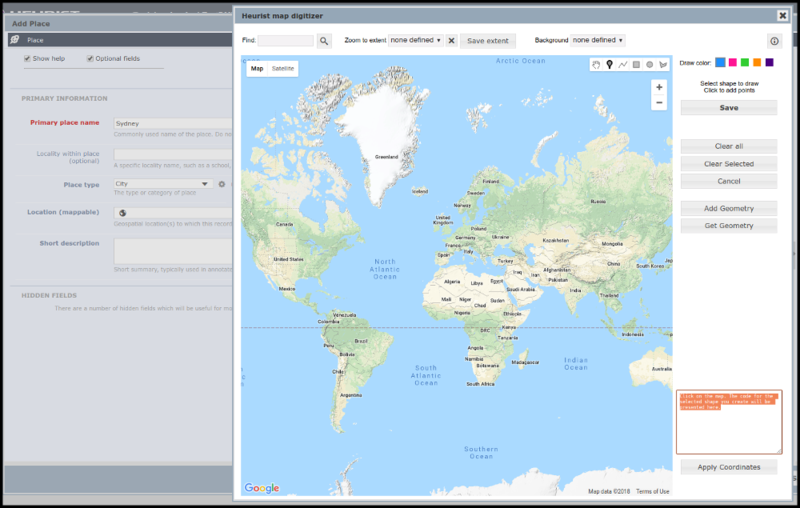 Import into a record type containing the “Location (mappable)” field, such as Place, and then map the Easting onto the Geo:longitude field and the Northing onto the Geo:latitude field (as shown in the background below). Heurist will automatically recognise the UTM coordinates and, once you click on the “UTM Coords?” button (shown outlined in pink in the image below), will prompt for the zone and hemisphere (you can only import coordinates from one zone at a time – break up the file into one zone segments if multiple zones are present). We have chosen to restrict import to one zone at a time, not for any technical reason, but to simplify the specification of locations (since most projects using grid references will fall within a single zone).